I think it's pretty safe to say all musicians have had the experience of someone saying "play us a song!" and your mind goes totally BLANK. You can't seem to remember a single piece of music you know, let alone how to play it. So today, we're talking about the importance of maintaining a playlist. Sometimes in the effort of learning to sight read, count and perform, we forget why we got into this in the first place. Was it to play music we've heard before? To share music with others? To create new music? Maybe all of the above? 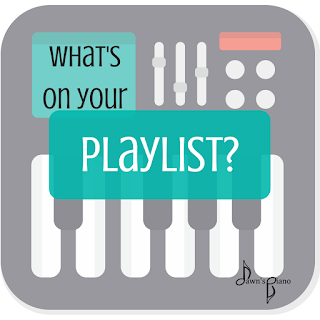 If we actively maintain a playlist of pieces we know how to play, we can do all of these things and more. We can confidently perform for family & friends when they ask. Sight reading is one of the *big things* we expect piano lessons to teach us. It's also not easy, for many kids it's as difficult, or even trickier, than reading English. It requires a lot of abstract reasoning power, repetition and work to really "get it." We know that a well-rounded musician pairs the ability to see and hear the notes with their awareness of the relationship between notes as they form intervals and chords to interpret and create music. So being able to SEE those notes is a very important part of that puzzle. 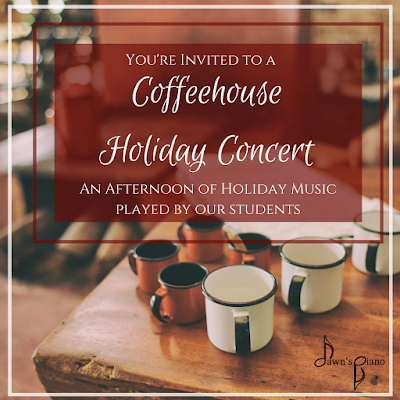 On Friday, December 22nd at 3:00 pm, our students are invited to participate in our first ever Coffeehouse Holiday Concert! This is a wonderful opportunity for a casual public performance - aka one of your first gigs! Rosebud Coffee, located at 2302 E Colorado Blvd in Pasadena is hosting this event. This is a non-profit business with a mission to help train & employ transitional aged youth in Pasadena who are at risk of homelessness. I am very excited to be able to partner with them for this concert, and help in their cause by providing some lovely holiday music for their patrons & employees and giving back to the local community. We are excited to present the finished works from the Young Composers 2017 project! And this year, we decided to add some visual art to the project. 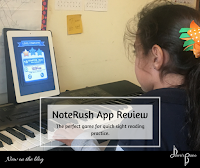 This means that in addition to composing, notating & recording an original piece of music each of our composers also submitted either a photo or drawing that they felt represented their piece to accompany their sheet music in the book. You can see some of the drawings our students did here. The intersection of visual and musical art is always a worthwhile exploration and I found myself intrigued, amused, and moved by the art each student paired with their song. 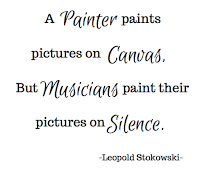 Each year that we've done the project, I've picked a quote to open the book, and this year the Leopold Stokowski quote pictured above immediately came to mind as I scrolled through the finished book file. And so, without further ado, I am thrilled to present the Young Composers 2017 book & album! To view the completed book, click here.